Amazing! A genealogist born near Trier, Germany, recently wrote to say he thought we share common ancestors Ignatius Becker and Magdalena Platt who raised seven or eight children near Zemmer, in the Trier-Saarburg district, Rhineland-Palatinate, Germany. Yes, I replied, we do, thanks to two of their daughters — Catherine and Apollonia – who migrated to Wisconsin in the 1850s. I told him that I remember well the day some years ago when I was looking up on microfilm the baptism of Apollonia Becker — and found it with the names of her parents. It says: Apolonia Becker, Female, Birth Date: 1 May 1838, Baptism: 1 May 1838 at Zemmer, Rheinland, Preußen, Germany, Father: Ignatius Becker, Mother: Magdalena Platt, FHL Film Number: 560484. Her baptism is now online at FamilySearch. Catherine came in 1851 to marry John Baptiste Miller / Mueller. They lived in and near Mineral Point and Dodgeville in southwest Wisconsin where John was a miner and farmer. They had 12 children. In 1854, Apollonia came alone, age just 16, to join her sister. She was not fond of her step-mother, as recorded in “I Was Born in America,” the autobiography of her eldest son William George Bruce (pages 22-23). Ignatius or Ignatz Becker and his wife Magdalena (Platt) Becker had daughters Agatha, Barbara, Marie, Catherine, Apollonia, and sons Anton and Jakob, according to a booklet on the history of the Miller Family, also by Wm. G. Bruce. Another daughter, Magdalena, is possible. They lived on the Schoenfelder Hof Estate, Zemmer, near Trier, Germany. The booklet also states that Ignatius died at age 83 in about 1865, at Zemmer, Germany. That gives him an approximate birth date of 1782. His given name appears as Ignatius, Ignatii and Ignatz, the latter in the Miller booklet. Zemmer is north of Trier in the Moselle River Valley near the border with Luxembourg. The genealogist who wrote to me has son Jacob Becker as his ancestor while daughter Apollonia is mine. In 1855, she married Augustus Friedrich Bruce who arrived in Milwaukee in 1839 with his parents and two brothers, part of the Old Lutheran migration. The family, surname originally Bruss, came from Cammin, Kreis Cammin, Pomerania. The Bruss men’s traditional occupation was sailor before marriage, then ship’s carpenter when married. Milwaukee is a port city on Lake Michigan. Apollonia and Augustus had nine children including my great-grandfather Martin Peter Bruce, an accountant, brewery manager, Milwaukee Athletic Club secretary and insurance agent. A long way from ship carpenter like his father and uncles. A group sheet for this Bruce family is online. Eldest child William George Bruce was an influential publisher and leader in Milwaukee. 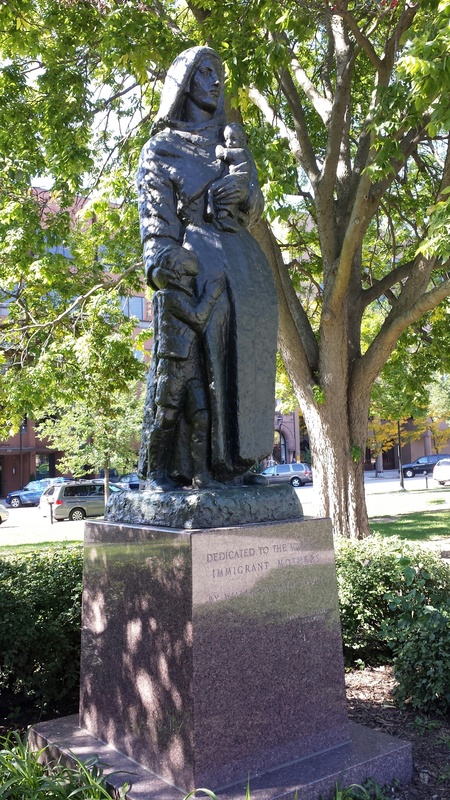 He lived to 93, and late in life was called “First Citizen of Milwaukee” for all he had done for his city, especially for the harbor and auditorium. His published autobiography mentions his ancestors and Zemmer. I wrote his biographical sketch for Wikipedia. Also among the nine was daughter Clara Bruce who married Alonzo Fowle, occupation printer. Their son of the same name served in the U.S. Army in World War I. Amazingly, Alonzo Jr. traveled with four other soldiers in the Trier area… and then came to the village of Zemmer [yes!!] and they were quartered with a family named Marxsen. The village priest Father Johann Eckert discovered that the young Alonzo was the nephew of William George Bruce who had visited Zemmer before the war. According to the latter’s autobiograpy [page 305], the priest said to Alonzo: “You are in the birthplace of one of your ancestors. Mr. Bruce’s mother, namely your grandmother, was born on the Schoenfelder Estate which immediately adjoins the village of Zemmer. And the Marxsen family are distant relatives of yours.” The Marxsen family then treated Alonzo and the other American soldiers to a feast, the book states. Interestingly, the genealogist who contacted me has ancestors named Marxen from Zemmer. Apollonia was a courageous, intelligent woman who raised her children to be good, hard working and successful people. I was happy to tell her distant relative in Germany about her story.